So I found this a while back. I decided to get some insight about my friends (and those other people) on this forum. So ... Tell me what you think of this, and what you would do. If I get enough replies I'll give my opinion. You can't ask for a poll and then not put the question in poll format!?!? I'll take the time travel pill. I'll go back a few Melania (I mean millenniums), and be the 13th Apostle... Rufus. I'd clean up in the BS NFL and Election Action threads. Take the black pill, then be able to steal one of all the other pills. Semi serious fantasy poll? Bah, I smote u with my sword of Andar. Engineer wrote: Where's the pill that lets me unhook bras telekinetically? Extraordinary power - so I could fly away from controversy. Turquoise pill. Half green, half Blue. I need organization skills. And tactision. Plus ability to live in a tree when the zombie plague hits. I'll rock the time travel. Likely because I make so many mistakes in life. I'd take immunity. I love hunting and fishing and the outdoors in general. Without my health I wouldn't be able to do all of the things I love. Additionally how can you pass up having the cure to cancer for the sake of mankind. Intelligence is the key to understanding all the rest of the powers and hopefully I could convince all to work together for the better of mankind. plus two unofficial votes for psyche from Engineer and ZZ. So, this is my logic. The warrior pill makes the strength one unnecessary, but I have no need for fighting skills. Further, I have no need to kill people, and I am unwilling to risk time traveling. As ZZ pointed out, the psyche pill includes the extraordinary power pill. 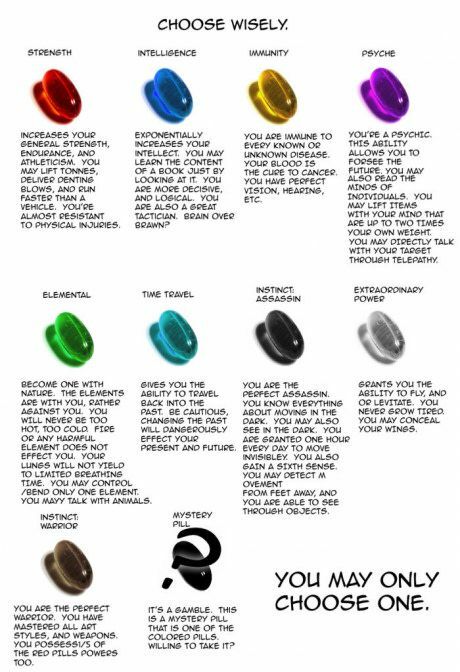 The psyche pill, in my opinion, is too powerful, and I don't especially need the elemental pill. So I take the Intelligence pill, and supplement my existing prowess. Plus, it's the best way to try and help humanity. You got any pills to get rid of this 3rd leg i've been carrying around all these years? My back is killing me.